The Science of Menu Engineering. The Psychology of Menu Design. How to Make your Menu Work Smart, Not Hard. placing menu items where they’ll stand out. and contribution margins, you lose money on your best menu items. and a better idea of menu statistics to follow for years to come. PDF, especially the following page, which has a calendar to follow on your journey. Restaurant data is your friend. You’ll learn how to calculate this in the following section. Gather your information in a spreadsheet so you can access it at all times. Cost of Goods Sold is beginning inventory + purchased inventory final inventory. another dollar added to your restaurant’s gross profit. related to purchasing inventory (excluding labor costs). white onion ($0.30) + 3 tomatoes ($2) = $3.30. Food cost percentage is menu item food cost / menu price. Contribution margin is menu item sales - food costs within a certain time period. react to changes. It’s basically the net amount of dollars you take to the bank. past success, evaluating your goals based on that historical data. Do you want to save more money or make more money? Depending on your current situation, you may want to look at food cost percentage or contribution margin. can be used to make important business decisions. popularity percentage with this equation: individual menu items sold / total menu items sold x 100.
you’re already marketing this item well on your menu. to get ready for the next lesson. What metrics do you need to track in a food cost analysis? What’s the difference between food cost percentage and contribution margin? Why is it important to look at individual menu item food costs? What are some ways to minimize restaurant food costs? What are growing trends, if any, that you see in the data before you? Lesson 2: Stars, Puzzles, and Dogs, Oh My! time period, such as this past quarter. superstars! These are your most popular and most profitable dishes. more money than you’re making. They have low profitability and high popularity. these items on your menu, make them specials, or position them in a different way. contributing to profit or profitability. kid’s mac and cheese, for instance). Instead of removing these dogs, you can deemphasize them by hiding them on your menu. 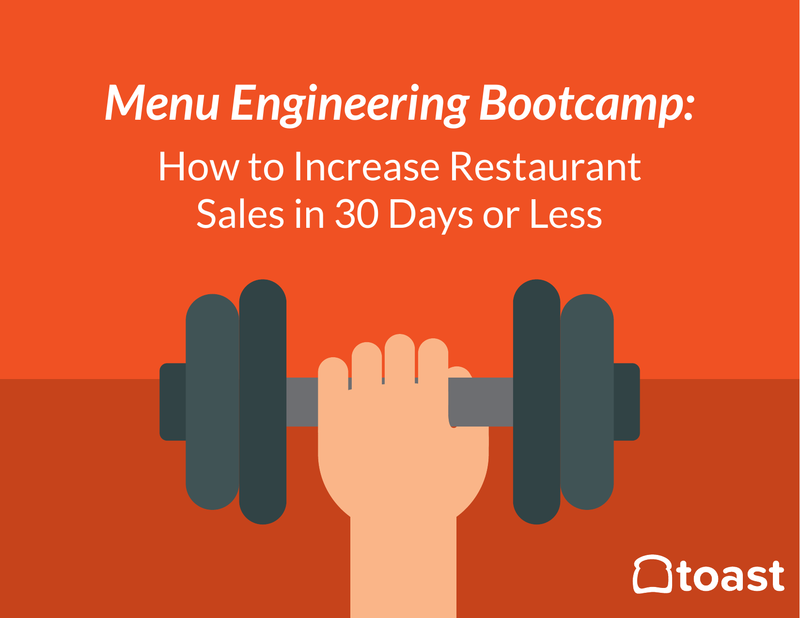 How will you use menu engineering in your restaurant? psychology, so you can learn some of the best strategies for optimizing your best menu items. What are the two axises on the Menu Engineering Graph? What do you do with dogs? What do you do with stars? What are some different ways of looking at your restaurant data? the top six psychology principles used in menu design. For more, subscribe to the Toast blog. only remember seven pieces of information (plus or minus two) at a given time. decision, but the reality is that we end up getting bogged down. category for pastas, and so on. This helps guests remember the highlights of each list. the anxiety that they could have made a better choice. was, and enticed them to pay more. example, fries $5, hamburger $10, hamburger and fries $10. of people they like or trust. It’s the “me too” effect. your food, why not also include quotes from customers or family members? Semantics refers to the relationship between signs and symbols and their meaning(s). Salience, however, is the relative conspicuousness of something in a given situation. money, which is never someone’s first option. people’s eyes will immediately flit to the top of the page or the top righthand corner. scanners and video cameras, revealed that guests read menus like a book. descriptive menu labels resulted in customers feeling more satisfied with their meal. with phrasing that is mouth-watering, scrumptious, and delectable. scan it? What ideas do you have for the future design? How can you highlight your puzzles to turn them into stars? What is the decoy effect, and how can you apply it to your menu items? What is an important symbol on your menu? What is the “me too” effect and how can you apply it to your menu items? How many menu items should be in each category to address paradox of choice? light in your restaurant affect its readability? hours, website, or social links. out on an opportunity to make the guest experience that much better. conversation with other guests, and overly cumbersome for waiters to collect. guests during each shift. Keep your menu simple. Remove those dogs. should subtly guide your guests. ignore the appetizers section entirely. servers or risk missing out on easy upsell opportunities. more money replacing them. Consider laminating your menu, or using thicker paper to print on instead. Unless your chef was once a professional copywriter, he or she should not be the only one writing menu descriptions. Instead, let a copywriter or publicist lead the project, with the chef and key wait staff giving their feedback. gaffes above? Return the menu for another draft until it’s perfect. What are some ways you can accidentally “over-design” your menu? What are some examples of upsell opportunities you can include on your menu? What are key ways to design the menu book itself? What do you think is the worst menu gaffe? (Opinion). software until your new menu is perfect. Congratulations! menu design, too. Or, if you don’t do a complete menu overhaul, A/B test your menu. times someone orders, based on your changes. half-year, or year, etc.) Congratulations, you did it! What metrics should you look at when comparing different time periods? How often should you engineer your menu? How has your menu evolved over the course of this course? metrics, automating sales, labor costs, food costs, and so much more. Get to know your couch better with Toast POS; sign up for a demo today.